DETROIT - Ken Horner had the honor of being the captain of Boblo Island's S.S. Ste Claire for two years. Now, Horner works as captain of Detroit Fire Department's fireboat, the Curtis Randolph, and was one of the firefighters that attempted to save the historic boat. While bystanders watched the vessel from shore, Horner witnessed his own memories burn. 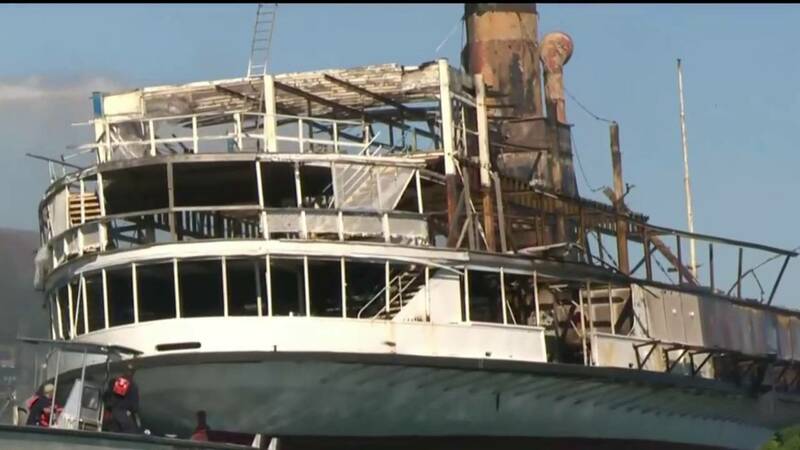 He shared memories of the boat and his time at Boblo Island on Friday, after flames ripped through the boat on the Detroit River. Watch a full interview with Horner above. "It's my first vessel I've ever stepped foot on," Horner said. The S.S. Ste Claire holds an important place in Horner's heart. He even met his wife on the ship when she was working in the souvenir shop. "I started as a deck hand in 1971," Horner said. "I worked my way to the top." Decades later, Horner is still able to see the beauty in the charred and destroyed ship. "I don't know if you ever saw the dance floor," Horner said. "It was all finished wood." The ship first sailed the 18 miles from Detroit to Bablo Island in 1898. "It was a family thing," Horner said. "It was a Detroit thing." Similar to Detroit, S.S. Ste Claire was on track for a comeback, but the restoration attempts ignited the fire, and memories are all Horner and others can rely on. "I'm not really sure what I'm going to do," Horner said.